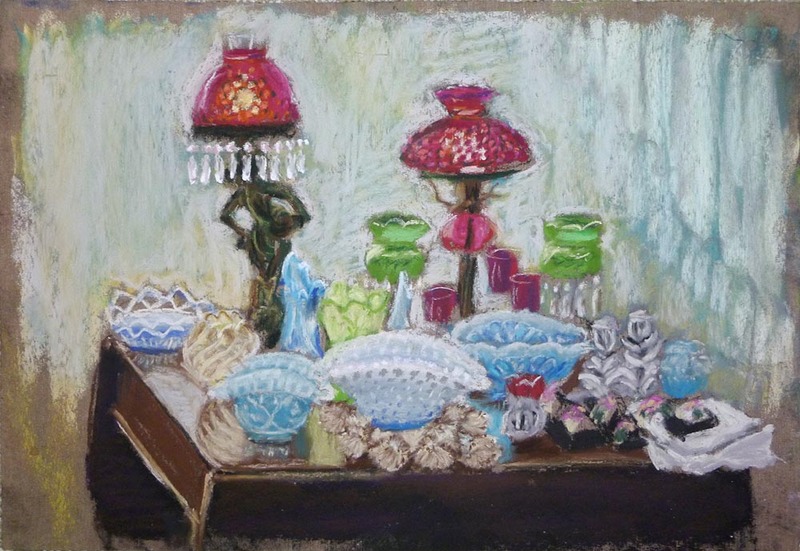 I spent the afternoon minding the shop at Carnegie Antiques and decided to paint a little sketch of a table of glassware that has recently arrived at the shop. Judi, the shop owner, had organized this table of decorative glassware last week; when I was in I was enchanted by all the colors and shapes and patterns. 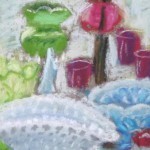 Remembering it, I decided the next time I was in I would paint that table of glass. Unlike other subjects, glass is translucent, both having a shape and allowing other shapes to be seen through it. It has a color but other colors can be seen through it as well, modified by the color of the glass. And instead of casting a deep shadow, it casts a pool of colored light on a table top. 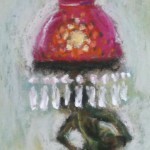 This painting is about 10″ x 12″ in chalk pastel on Wallis sanded pastel paper. I painted it in about 90 minutes, then touched up a few things when I got home with pastel colors I didn’t have in my little traveling box. There are four different shades of blue here, two shades of green and three of the cranberry glass. My traveling box is a cheap set of mostly primaries and secondaries, perhaps an extra shade of some of the like red-orange or apple green, plus black, white and mid-gray. 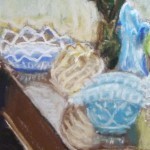 I can capture quite a bit with those pastels by blending in place, but not always the nuances of glass. There is glass from nearly every era there, opalescent milk glass, Depression glass, colored, etched, painted, plus napkins and napkin rings over on the right and two hobnail lamps with cranberry glass, one a nice respectable table lamp and the other a naked lady with a lampshade on her head. Those Victorians knew how to entertain themselves. The sketch is done in pastels on sanded pastel paper.